The legendary Space Hulk returns to the Sony Playstation 3 and Playstation Vita in this epic turn based strategy game. Set in the Warhammer 40,000 universe, an intriguing story of legendary battles and heroic actions unfolds. 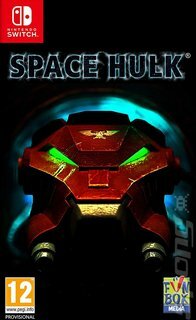 Play as a small squad of fearless Space Marine Terminators who attempt to reclaim their honor by mounting an assault on a derelict space hulk infested by hordes of vicious tyranid Genestealers. Take control of the Adeptus Astartes of the Blood Angel chapter and guide them towards glory, while battling fierce Xenos and uncovering ancient relics in the infested confines of the massive Space Hulk named Sin of Damnation . Thematic 3D environment! Experience the dark labyrinth of a Space Hulk as never before. Single player campaign based on the Sin of Damnation space hulk! Take on the Sin of Damnation campaign, which includes 3 brand new prequel missions and the 12 missions from the classic board game.